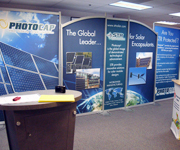 The global leader in encapsulant technology for the solar industry. Specialized Technology Resources, Inc. (STR) was the first in modern encapsulant development and is the industry leader of providing the highest quality encapsulants for the solar industry. STR’s Photocap® technology provides non-shrink lamination, electrical isolation, physical protection and thermal conduction for solar circuits to maximize the life of solar cells. Our advanced additive technology in Photocap® provides structural integrity to the PV module to prevent physical property degradation. The proper selection of the Photocap® encapsulant can greatly improve PV module lamination cycles, in addition to increasing adhesion to glass, PV substrates and other module substrates (e.g. back sheet).